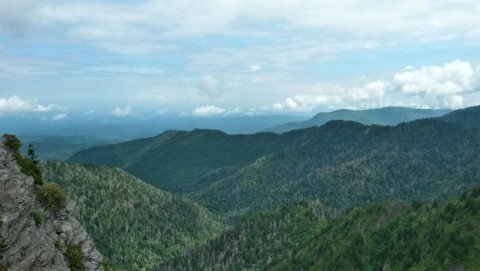 The view from Charlie’s Bunion, which is a rock formation on the Appalachian Trail. This past weekend, I spoke at the Appalachian Home Educators Conference. I gave a total of eight talks over three days, which is a lot! Six of the talks were solo: Being a REAL Environmentalist, Why Homeschool Through High School, What About K-6 Science?, “Teaching” High School at Home, “Teaching” the Junior High and High School Sciences at Home, and Teaching Critical Thinking. 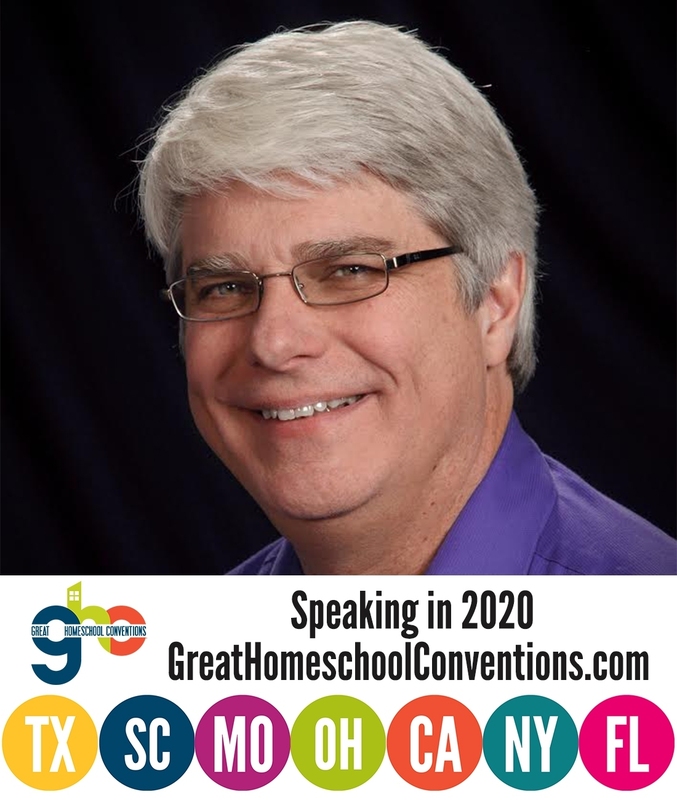 I also did two talks with Diana Waring: Homeschooling: The Environment for Genius and Textbook Myths and How to Deal with Them. In addition to having a great time talking with homeschoolers, I got a chance to spend some time in the Great Smoky Mountains National Park. The highlight was an 8-mile hike (4 miles there and 4 miles back) on the Appalachian Trail to a rock formation known as “Charlie’s Bunion.” The rock formation itself isn’t all that spectacular, but the view from it is! The picture above gives you some idea of what I saw. It was truly gorgeous. Of course, the conference was the reason I went, so let’s get back to that. The talks went well, and I got a lot of great questions. One student who had used some of my books and then went to a secular university came up to me while I was at my publisher’s booth. He had a whole list of questions he wanted to ask me after spending a year learning science from an evolutionary point of view. I enjoyed answering his questions, and I was so happy that he was willing to take the time to get a different opinion instead of just blindly accepting what his professors told him, as is (unfortunately) the case for so many university students. Rather than highlighting some of the questions I got, I want to discuss an incredibly fascinating talk that was given by John Joslyn, the Executive Producer of Return to the Titanic … LIVE, which aired in 1987. It was a television show about a submarine going to the wreck of the Titanic and recovering some artifacts from it. He has built two Titanic Museums, one in Branson, Missouri and one in Pigeon Forge, Tennessee, the latter of which wasn’t too far from where the conference was held. Joslyn showed pictures from the expedition that was the subject of his television show. They were interesting, but I thought the most interesting aspects of his talk were two details he gave regarding the mechanics of the expedition. He first said that the submarine he and his colleagues employed to get to the wreck (which is about 2.5 miles deep in the North Atlantic) used no power when it descended and ascended. He said that the submarine was weighted so it was just a bit negatively buoyant. That means it sunk naturally, but very slowly. He said it took about 2 hours to fall through the 2.5 miles of water. The submarine was dropped far from the wreck so it would not get caught up in any of the debris. Once it hit bottom, the submarine used power to move to the wreck and maneuver around it. When it was time to ascend, they moved away from the wreck and dropped enough weight to make it just slightly positively buoyant. That allowed it to ascend back to the surface slowly. They did this 33 different times over the course of the expedition. Of course, this all makes sense when you think about the limited space available on the submarine. Limiting your power consumption is smart when you are dealing with a submarine, where space is at a premium. However, I never would have thought about it had he not mentioned it. In addition, I had this rather naive idea that when the submarine picked up artifacts with its mechanical arms, they would be put in some sort of waterlock on the submarine so they could be brought to the surface. Once again, however, with space at such a premium, that wouldn’t make much sense. So the ship’s crew would drop a metal basket that had floatation devices on it but was heavily-weighted with anchor chains. The submarine crew would use the mechanical arms to put artifacts into the basket, and when they were done, they would pull out the anchor chains, and the basket would float to the surface. I thought it was really cool that those kinds of “low tech” measures were used on such a “high tech” dive. It was an honor to meet you and talk with you at AHEC. Thanks, Adriana. I am glad my two talks were useful for you!